"Just as good as the cholesterol-laden original. Created for diabetics, but great for anyone trying to reduce their fat intake. For added flavor try using a garlic and herb Parmesan cheese blend and to increase fiber content use whole wheat pasta. Easily doubled for when you need more than 2 servings. Enjoy!" In a large pot cook with boiling salted water cook fettuccini pasta until al dente. Drain. Meanwhile, in a large saucepan over medium-high heat melt margarine; add garlic and saute for one minute. Add flour, stirring constantly. Gradually whisk in milk, continue to stir until sauce thickens, about 5 to7 minutes. Add the Neufchatel cheese, grated Parmesan cheese, and ground black pepper. Cook until the cheese has completely melted. Serve Alfredo sauce over cooked and drained fettuccini noodles. Sprinkle the top with fresh parsley. 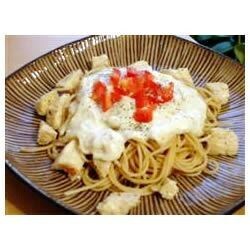 This chicken Alfredo pasta dish is rich and satisfying. I used butter and cream and skipped the flour.....which made this the best Alfredo EVER! I also made it with shrimp and immitation lobster chunks....OMG, to die for! I think this had a bit too much garlic. It was a little overpowering. I really like fettuccini, but this is a recipe that I would probably not make again. Very tasty, could not tell it was low fat. Easy way to make homemade alfredo sauce. My recommendation is to double the recipe, because you'll want leftovers! this is pretty good. I added a lot to it. I added broccoli, mushrooms, green bell peppers and onions.